Game day! That's right, it has become a huge deal in our home to sit and watch football. It only took my husband 44 years to finally decide that he likes football. I should rephrase that, that he likes to sit and watch football. He is no longer content to read the sports page and sip his coffee. He wants to see every play first hand. I thought I was one of the few wives left on earth that was lucky enough to not have my Sundays and Mondays ruled by a football schedule. I am saying this all in tongue and cheek because I love football. I grew up watching it with my grandfather. That was back in the day when the Chicago Bears had the Refrigerator (a player). I have enjoyed having the time to spend with my hubby and with our kids. We make yummy food, choose teams and wear our favorite colors. This season we hope to be wearing a lot of PURPLE…go RAVENS! This dip is popular throughout the web and can be found on numerous blogs, Pinterest accounts and feeds. It's not that hard to throw together but it is still so dang good. The dip can be made up the night before and the topping can be ready to go in a baggie. It's a great traveler to take to friends and family that are having game day parties. You can alter the temperature of the dip based on the jalapeno's used and wether you decide to have seeds or no seeds. 4-6 jalapeno's, chopped and deseeded. The seeds will make it fiery hot. Combine all of the ingredients into a medium bowl. Stir well. Transfer to an oven proof dish. The size of the dish depends on how thick the dip is. The thicker the dip the longer it may need to warm up. I used this stoneware dish that is round and measures 12 inches across. My dip is usually about an inch thick. Combine the topping ingredients and sprinkle all over the top of the dip. 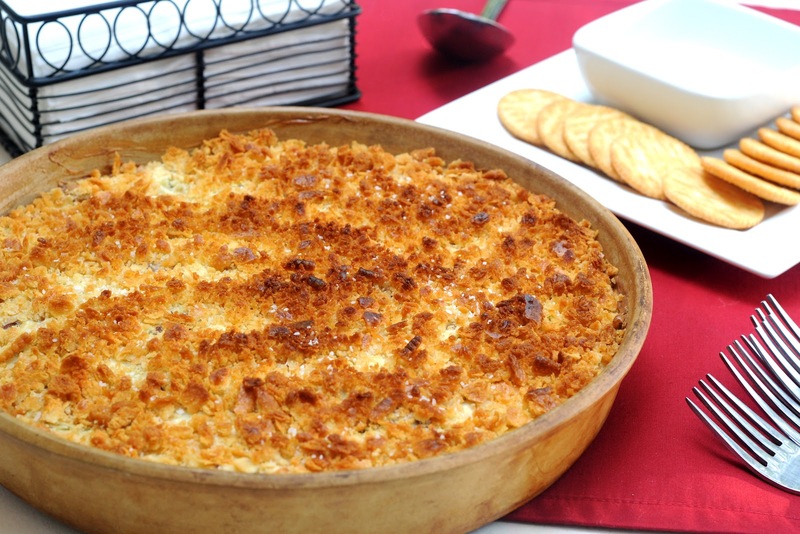 Bake the dip for 20-30 minutes or until bubbly. 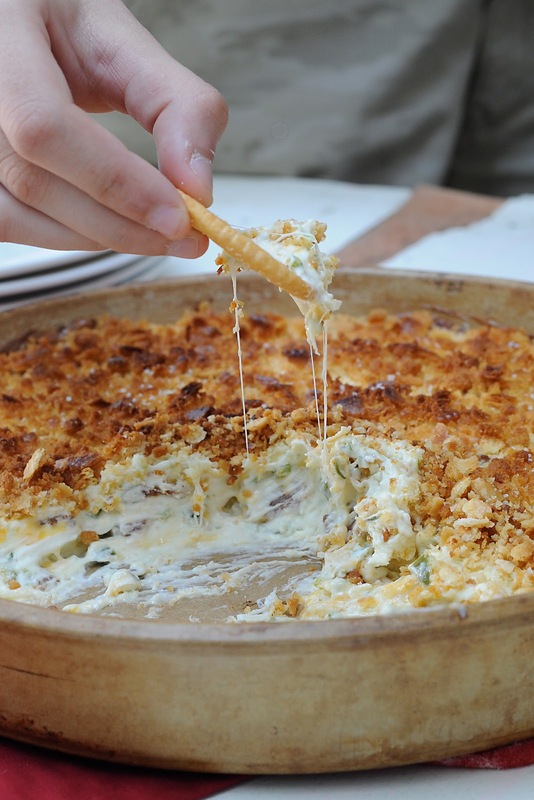 We make jalepeno poppers all the time on the grill and I've heard of this dip, just never whipped it up before. It's gonna happen this year for football season. Thanks for sharing. (Griffins hubby) Holy crap..I do bacon wrapped japs on the grill a bunch..with shrimp on occasion..but im lookin foreward to trying this...looks spectacular. .
Oops..my wife sent me this link..looks like thats not my wifes comment..lol. I cant seem to delete mine..sorry whoever griffin is..
OMG, this is hilarious! I feel like Nick is my hubby. I'm new to this and would like to print the recipe, but can't figure out how. Can some one direct me? It was awesome!!!! Gave it a try at a family gathering this summer and they loved it. Would I make it again.......you bet!!!! I made this today for a family gathering, what a hit!!!!! We ate 1/4 of it before we even left our house and the rest was gone in an hour flat after we arrived at the party!!! Everyone raved!!! 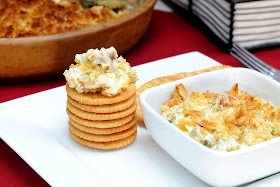 This dip was a hit at our party. A definite keeper. Uff, this dip looks amazing! need to make this for the weekend! Wonderful dip, beautiful shots! This recipe was an instant success on RecipeNewZ and now it is featured on our Facebook page http://www.facebook.com/recipenewz Congratulations! Thank you RecipeNEwZ! I noticed the traffic and I appreciate it a lot!!! this looks so good did u come up with it yourself? This dip is AMAZING!!! Made it for a tailgate and it was instantly everyone's favorite (and being a southern gal, I make ALOT of stuff for tailgates!!). Every game since, it is the number one requested item whether we are watching at location or at home! Thanks so much for this one! It is GREAT!!! I have a mayo phobia, subbed sour cream... was great! Thanks for sharing! Plain yogurt works just as great as sour cream too! umm what if you dont have the topping would it still taste good? i made something similar before but used sour cream and onion dip instead of mayo and green onion, it was awesome but i am wanting to take it to a dinner party i cant cook it there should i cook it before hand or should i put it in a crockpot? any suggestions would be appreciated thanks! Thanks for the idea for substitutions on the Mayo--- Me too! Bad experience with hot mayo! If it's not cooked enough or sits out too long, it can give you food poisoning. I love POPPERS! Cant wait to try it! Thank you, I hate mayo so your post helped a lot. Just FYI that store-bought mayo is not going to give you food poisoning since it is made with pasteurized eggs (which are heated to kill bacteria) and has a high level of acidity (vinegar, Lemon juice) which inhibits bacteria growth. Yes. I am a microbiologist (nerd!) and the mayo is pasteurized, so it cannot give you food poisoning as long as you don't eat the dip after it has sat out for 3+ hours...that's the timeframe for bacterial growth. A sealed jar of mayo has a very long shelf-life. When you open it, you need to keep it refrigerated or don't eat it after it sits out for multiple hours. I substituted ranch dressing and a dollop of greek yogurt for the mayo--very yummy! Just eye-balled the amounts. It is actually the onions in stuff that collects bacteria. MYTH: Mayonnaise is often the cause of food-borne illness. REALITY: Mayonnaise does not cause food poisoning, bacteria do. And bacteria grow best on foods that contain protein and are at temperatures between 40-140 degrees F. Commercially prepared mayonnaise is safe to use. At greater risk for developing bacteria are the foods mayonnaise is commonly mixed with for picnics and potlucks, such as pasta, potatoes, eggs, chicken, or tuna. But even these will be safe if you keep your cooler below 40 degrees F.
This dip is cooked, Mao is the cause of bacteria in cold salads when at room temperature. have a ton of peppers i need to use!! thanks for the idea!! Same here. Definitely gonna give this a try. Looks and sounds delicious. I wonder if you could sub Greek yogurt for the mayo to cut calories? I'm trying this recipe ASAP! I think you could but keep in mind the flavor may be a bit more sharp than if you used mayo. I know someone has used sour cream and they said it turned out well. Let me know if it worked and i can add that option to the recipe. Have agreat night. Wondering if you could use cream cheese instead of mayo??? :) Looks great!!! Wondering if jarred jalapenos would be ok to use? Hey! I substituted the fresh jalapeno for a 7 oz can of chipotle peppers with the sauce and it turned out really well...i raised the heat by adding some red pepper flakes. Thanx for the recipe!! Thank you for letting me know! My hubby would love those substitutions and I will give it a try on the next batch I make. Do you use shredded cheese? I did use shredded cheese. FOR TOPPING TRY USING PANKO BRAND BREAD CRUMBS!!!! ITS THE KEY! I will give that a try. Thank you for your suggestion! better eaten hot or cold? I like it hot or warm fresh from the oven or preheated in the microwave. I made this tonight, but replaced the jalapenos with 5 banana peppers and one cayenne pepper from my garden. It was amazing!! Thank you for this recipe, I will be making it many more times from now on, I'm sure!! I am so happy to hear that you enjoyed the recipe. Your changes in using banana peppers sounds awesome! I will have to try that the next time I make this. Thank you for your feedback! Thank you! We have ran several high standard scans and found that I don't have any malware currently being detected on my site. I have removed some buttons that I don't use and I hope this solves the problem. Thank you for letting me know. I was so excited to see a fellow football fanatic that has great taste in Sunday football food ... and then you had to go and say "Ravens". Just kidding (well, not really!) LOL! I am going to make your popper dip this Sunday when the REDSKINS play. I will keep checking your blog for other different snack ideas. We like the Redskins too, it's just that my husband has decided we are Raven fans. He already owned a purple shirt. I have a few friends that march in the band for the Redskins. I believe your fans will love this dip. YAY! I did make the dip ... it was amazing! Thank you so much for sharing! I will!! Thank you Pam for letting me know. I hope your team wins today. :) Yes Pam GO REDSKINS!!! I am going to try this recipe with Gluten Free bread crumbs I hope it turns out as well! One of my favorite apps in a dip! I will put this to the test on Sunday! Looks and sounds wonderful, and if there was a smellarecipe app, it would smell great. Have to try this one!! Try adding chopped chicken or a can of chicken to it...yummy! YUM, I bet that does make it delicious. Thank you for the suggestion. Going to make this for a cookout this weekend, looks so yummy! One questions, is it good with tortilla chips or have you just had it with crackers? We have had tortilla chips, bread and crackers. I like all three. It's really a personal choice. My oh my! I saw this on RecipeNewz and had to come by and tell you that you've made me very hungry :) It has been pinned to my Appetizer board on Pinterest and I look forward to trying it soon. It's also very good with celery. i dont eat bacon, can you make this without the bacon? Yes, you can make this without bacon. I am assuming that you lose some of the flavor combination but you could add a bit more jalapeno to compensate for a greater flavor palette. I made this. I used sour cream. And equal parts mozzarella and cheddar. So good. My family inhaled it. Thank you. Thank you Cori. I am glad to hear sour cream worked. I will have to use that next time. Have a good day. Sherron. I made your recipe and it was delicious. I have a popper recipe that calls for garlic powder and chili powder. I added that to your recipe and everyone just loved it. Thanks so much for sharing. Fantastic! So excited to here of your changes. I will take note and add those the next time I make this for my family. Has anybody tried to make a gluten-free version? What did you use for a topping?? I haven't made it but crushed Corn Chex should do the trick. I wouldn't use Corn Chex, as they have a bit of a sweet taste to them. Betsy, I would probably get some Glutino crackers and crush them to use. I've subbed them into other recipes before and they work just fine. I am going to try next weekend with Gluten Free bread crumbs. But Glutino crackers would work also! Made this today. Left recipe alone and made it as listed. Was incredible!! Will def make again! Thank u for sharing! It looks and sounds wonderful. I'll try it soon! Could you use just one block of cream cheese? hello, yes you can use one package of cream cheese, but you may want to alter some of the other ingredients too. If you choose to not alter them, then the dip will probably be really cheesy (which isn't a bad thing). Good luck and let me know how it turns out. I can't wait to try this dip this Sunday!Go Redskins!!!! I have a child with an egg allergy, no mayo for us. Has anyone had this after its cooled down? I wanted to take it to a tailgate this weekend but not sure how I would keep it warm! I was thinking the same thing!! Or could you keep in on warm in a crockpot?? I was wondering the same thing! How does it taste after it has cooled off? have never had it cool our cold so i would not be able to answer that question. I hope that someone who sees this thread and has tried it could give you feed back. A co-worker of mine brought her popper dip to work in a crockpot to keep it warm all day. Worked perfectly! You could also get one of those bakeware dishes that comes with the zipped cover and the heater pack you microwave. I love mine and it keeps it really warm! If you transfer it to a crockpot does the topping go on afte you transfer it? Or do you just mix it in when you transfer it from the oven to the crockpot? Add the breadcrumbs after you transfer the dip or they will get soggy. i have been making a version of this recipe for years and it is always a hit. a couple of variations, i add a can of shoepeg or white corn or a can of mexican corn...it gives it another depth of flavor. i always vary the peppers i use - sometimes its just jalapenos and sometimes i will get crazy and add a habinero. i usually serve it with a tortilla chip, but i have also served it on a brisket taco... there are no limitations on how you can serve something so yummy! oh and by the way, i have served it hot and cold and hot is better but cold is good too as long as the cheese is melted well in the beginning. Enjoy! Thank you. I love your variation of this dish. This is on the menu tonight for my daughter's 18th birthday party--her pick. Watching a movie with friends and eating dip with tortilla chips and crackers. I hope it was a hit. Happy belated birthday to your daughter. I can't wait to make this for my husband - we love football! I really like the stoneware dish you serve it in - where did you get it??? Thanks!!! Pampered Chef used to carry a stoneware dish like this. I have one. Maybe they still do.This dip sounds awesome. I live with a pepper fanatic. Can't wait to try it.Thanks! Pampered chef still has that stone....love it!!!! The stoneware dish was a thrift store find…LOL I paid $5.00 for it and use it often. 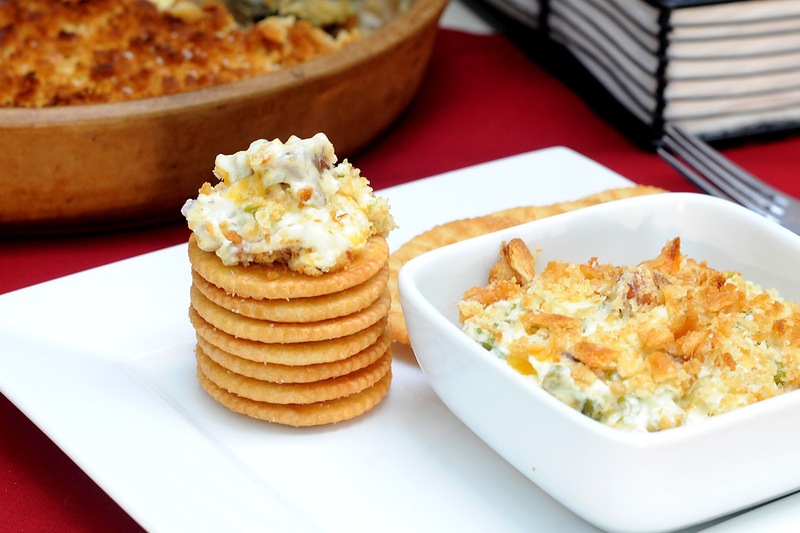 You will love the dip it's a game day favorite. Thanks for the comment. Just made this dip and it's s wonderful. Thanks so much for sharing. This will be great to bring to holiday parties! Cannot wait to make this! Looks delish! Go Ravens!!! Has anyone tried using the canned jalapenos? Thanks for sharing!!! Canned jalapeno's would work fine. I just always have fresh ones on hand. Taste your canned version first to establish how spicy they are before adding them to the dip. Let me know how it turned out. I've made them with fresh and canned jalapeños. ...fresh are better. I also substitute the crushed cracker crumbs with Panko bread crumbs and serve with tortilla chips. ALWAYS a hit! can you make this in a crock pot? Yes, but be careful to not overcook the cream cheese or it will separate and not look as tasty, even though it still is. I would recommend on high for 2 hours, or until warm. Let me know how it turns out. Thanks! Thanks for the recipe! We had it at our football party yesterday and it was a terrific hit! The only variation I used was panko bread crumbs instead of ritz crackers. Panko Crumbs are a wonderful substitute. So glad that you enjoyed the dip. So excited to try this dip! I've had it pinned for a while now, but will be making it this Saturday for my daughter's bday party! My husband and I both love dips like this and it sounds perfect for the party, and football season (go Steelers!!). I'll be trying with sour cream instead though..I have a serious mayo phobia! I know of several readers that have used sour cream instead and have said it turned out wonderful. good luck! Hello….I make a similar dip, buffalo chicken and cream cheese that I cook in the crock pot all the time. It usually takes 2 hours on high. Just be careful to not overcook it or the cream cheese starts to separate a bit. It still taste great, just not as pretty. I hope this helps. I. Am. So. Making. This. But I have to omit the crackers on top since I'm low carbing. Thank you. I think it will still be delicious. Enjoy! saw on Pinterest...am making for the RAVENS game this weekend! Seen on Pinterest as well...made it last weekend for a pre-halloween party. Wonderfully easy and delicious! great recipe/ page. I am going to have to take this to work in a crockpot to keep warm. So, do you think that if I bake it the night before (without the toppings), refrigerate it that night, transfer it to the crockpot in the morning, add the toppings, and keep on low for about 3 hours it will be okay? When do you suggest I add the toppings? Thanks! Good Morning. Based on the other comments that people have left in regards to keeping it in a crockpot it does very well. I would recommend that you not precook the dip the night before. You should be able to mix the ingredients together, minus the topping, add it to your crock pot for the 3 hours and it should warm up nicely. I don't know how crispy the topping will get in the crockpot, I would give it at least an hour to warm with the dip. Let me know how it turns out for you. Enjoy your day! This looks delicious!!! But, I'm not a football fan -so I'm a little upset that I won't be able to try this. Oh I think you should try it any ways. It's okay to not be a football fan it is just in my home town it's a huge thing and so I catered to those fans in Annapolis. Enjoy your day! If you don't cook it and only warm up the dip, it stays nice and creamy. I think the cooking part must break down the oils in the cheese and cause that to sit on top of the dip. Thank you for your question and I am so happy the dip was a success for you! You should be fine with out the green onion. Looks super yummy! I think I might make this for the ugly Christmas sweater party we have been invited to this year. Have made a few times now and serve with a variation of crackers and chips. I find my favorite is on a flour tortilla. Thanks for the feed back Brandi. Glad you enjoy the dip. I made this yesterday for the football game and it was gone in no time! It is soooo good! I used sour cream instead of mayo. Other than that I followed the recipe exactly. Will be making this for get togethers alot! Thank you for the feedback about the sourcream and I am so glad the dip was a hit! Can I put this together,refrigerate and then bake the next day? Yes. My only suggestion would be to leave the cracker topping off until it is time to bake and be sure that your dish is not too cold when you put it into the hot oven, depending on what you use it could crack or break. Enjoy the dip! Made this weekend and it was HUGE hit. Think I'll be expected to bring to every party I go to. I didnt have Ritz, so i used 1 cup Progresso plain bread crumbs. Next time I would cut bread crumbs to 1/2 cup. Either way, delicious! This was delicious!!! I ended up making it two days in a row! Thanks for the recipe! Can I use sour cream instead of cream cheese?? Wondering has anybody tried making this in a crockpot?? working out more. Thanks for wonderful information I used to be searching for this information for my mission. I can't wait to make this for my Cookie Exchange Cookie. I will feature this recipe on my blog after I make it. Should be in a couple weeks. Thanks for sharing! Made this for the Macy's parade viewing celebration-awesome-thank you! 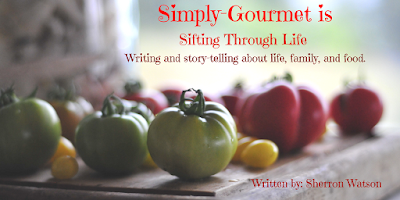 Re-posting it on my blog this week with your link! We make this all the time, except we add 1 pound of cooked breakfast sausage to it. AWESOME!! Wonderful dip! Thanks for sharing. I made it using a few different ingredients and because it was so wonderful.I want to share them with everyone. I only use Hellmans mayonaise for anything that calls for mayonaise, used Fiesta Blend Cheese Walmart brand,and Panko instead of crushed crackers. Panko gives it the most wonderful crunch. We've made this several ties for various parties and it was a major hit each time! Thanks for sharing. I'll be making it again for Christmas and might try tome of the suggested substitutions. Thanks again! Really LOVE this recipe!! Made it for the family a month ago and it was requested for our Christmas Eve get together. YUMMY! Made this for a family get together tonight. I used pickled jalapenos instead of fresh and just sort of taste tested my way to the right heat :) Was a HUGE hit. It's going to be on the menu from now on! Making this for New Year's! This looks great!!!! As a vegetarian, I will have to figure out what to do with the bacon issue, and will definitely use greek yogurt (getting my news resolution started now- eating better.....). Thanks for the idea and I will let you know how it works. And yes, GO RAVENS!!!!!! We love our hometown team!!!!! this is a perfect dip for football watching... or any random Tuesday ;) I love the topping - I WILL be making this one soon. Cheers! I made this for new years eve and it is delicious! Thanks so much for sharing recipe! Everything else I followed exactly (even used crushed Ritz) and it was amazing!!! I've made 2 batches exactly alike. My wife, my friend, his wife, and both of my parents all LOVED it. We ate this with On the Border tortilla chips, and it went FAST. I got praises from each person who tried it! I used 8 strips of Hormel Black Label (Original) bacon, cooked crispy in the oven before dicing them for this recipe. I used 4 medium fresh jalapenos (I've noticed that they come in many different sizes - at least they do at my grocery store). I cut the ends off of each one and discarded them, cut the remaining part into slices, and removed the seeds from each slice with the knife I used to cut them. I did not remove the membranes - JUST all the seeds. This was fairly time consuming, but DEFINITELY worth it!!! After dicing the de-seeded slices, I found that this added the PERFECT amount of heat to the dish. It wasn't overwhelmingly hot/spicy, but at the same time that Jalapeno kick was a prominent flavor of the dish! Why not add some of those fried onion rings on top ( the ones used in the green bean casserole) the last 5 min. Thank you for the recipe. I used it to enter the Chip n' Dip Competition at work and WON Best Overall Dip! I did make a few changes to the original recipe and used light sour cream for mayo and Panko Bread Crumb for crushed crackers. I'd love to try your recipe, however I'm left with questions. Japalenos, are we talking fresh, or canned? I'd assume fresh, should I fire roast them prior to dicing them up? Parmesan, again are we talking freshly grated from a block, or are you talking Kraft shake out of a bottle? Lastly, Butter. Salted or Unsalted butter. As a baker I know the type of butter makes a huge difference. The recipe sounds salty enough with the bacon, parmesan & Ritz. 1. I used fresh jalapeno's. From the comments above, others have used canned with great success. 2. I always use fresh parmesan. I have not tried the canned version before. 3. I used salted butter because that is what I had on hand that day. I did not notice an overly salty flavor to the dip with the addition of the bacon, but I also use bacon that does not contain any type of Nitrates, so it tends to not be too salty. You will have to decide based on the type of bacon you use wether the butter is salty or not. THIS IS THE BEST! Seriously so good, and so easy to make. We made it for our football party and it was a HUGE hit. Thank you so much! I made this for Super Bowl yesterday and everyone loved it! I used panko instead of Ritz and lite mayo in place of regular and Mexican 3 cheese blend. I will definitely be making this again! It's in the oven now! can't wait to try it while watching the race. difficulties with your RSS. I don't know why I am unable to subscribe to it. Is there anybody getting the same RSS issues? Anyone that knows the solution can you kindly respond? Thanks!! Laura Kline....you are soooo hottt!!! ωorking on beginning my own blog soοn but I don't really know where to start. Would you suggest starting out with a free platform like b2evolution or go for a paid option? There are so many possibilities out there that I'm quitе ovеrwhelmed. .. What wοulԁ you say? So first of all pasting the Vinyl Sticker Sheetss. To make sure that it is a good bet for healthy eating. 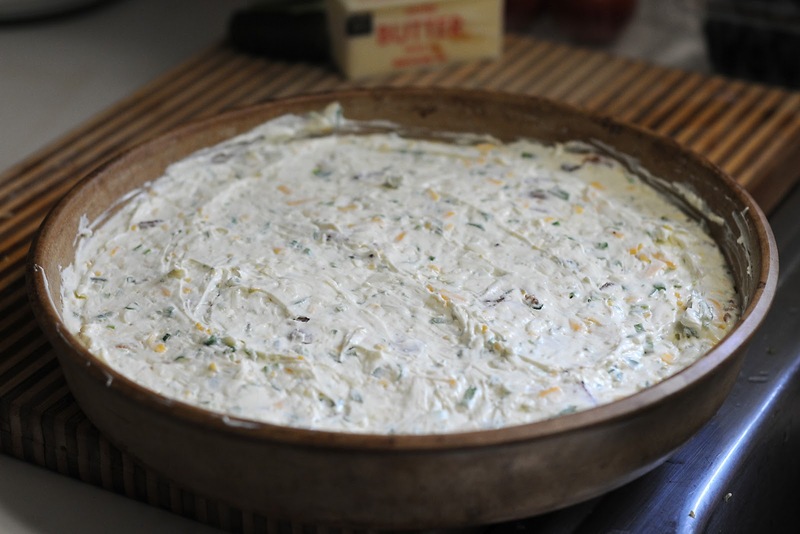 I recently made this dip for a group of men and it was a hit. They did not even notice that I accidently used immitation parmesan cheese. Haha. Thanks for recipe! I will definately be using it again. Just made this tonight. It was AMAZING. I added some garlic, ranch powder seasoning, and cayenne pepper. Do you use fresh jalapeños or pickled? I have made this 3 times this month!! I used jarred jalapenos and panko bread crumbs instead of the crackers and it turned out great. Thanks for my new go to dip!! This looks fantastic! Can't wait to try it. And you said the Refrigerator (a player) and I couldn't help but remember William "The Refrigerator" Perry doing the Super Bowl Shuffle...great memory! Making this for the Super Bowl today!! This has been renamed "crack dip" by my friends it's literally that good and addicting! thanks so much for the recipie this is definitely going to become a normal occurrence since I keep getting asked about it!! This is my favorite dip! I never have leftovers when i take it places. Thanks for the recipe! This is to die for!! I didn't have green onions or mayo so I used sour cream. It was great with pita chips and fritos. My vegetarian friend was eating it even though it had bacon (she knew but couldn't resist). Sooo good! This recipe is absolutely wonderful! I fixed it for an employee Christmas party and couldn't believe the number of people that asked me for the recipe! It will definitely become one of my go-to recipes for get-togethers. This dip is amazing! I've received rave reviews every time I've made it. Even the people who were leery of it being too spicy love it. It is now one of my go-to recipes when making food for a crowd. Do you bake it uncovered? You can or cover it with foil. I usually bake it uncovered. So this is something you can't put up and reheat? This was a huge hit during our Super Bowl party this year! Didn’t last very long! I would absolutely make this again!! Thank you for the wonderful recipe!